A Fiji die reconstruction has been achieved by stitching together multiple images published by AMD showing various parts of the die. What has been uncovered is very interesting and matches the memory spec that our sources have been telling us about. Now I should point out that we have been working on our own analysis and calculations around the Fiji die for a few days. And we’ll be referring to our own numbers, however we’ll use Videocardz’s visual reconstruction for illustrative purposes. Now the first thing you’ll notice is that there are 4 HBM stacks packed on the same interposer as Fiji. Just as AMD’s Joe Macri had implied a few days ago. 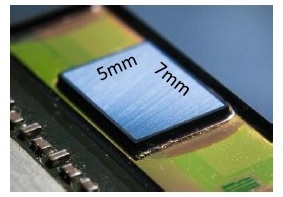 Each HBM stack has a capacity of 1GB of memory, as far as we are aware stacks with more capacity are not available yet. The second thing you’ll notice is that Fiji is actually quite large. 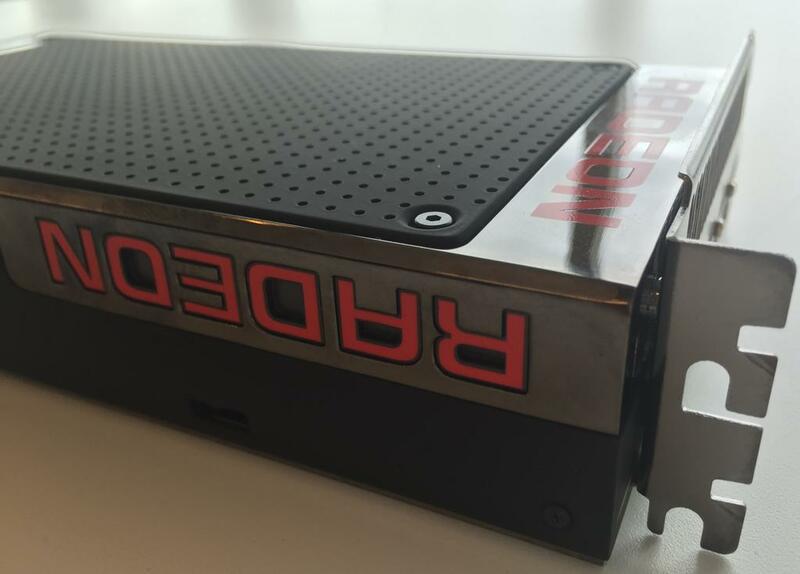 The largest GPU AMD has ever engineered in fact. With regards to measurements, the GPU is exactly 21mm wides. We arrived at this by using the width of an HBM module as a measuring stick. Because we know an HBM stack is exactly 5mm wide. 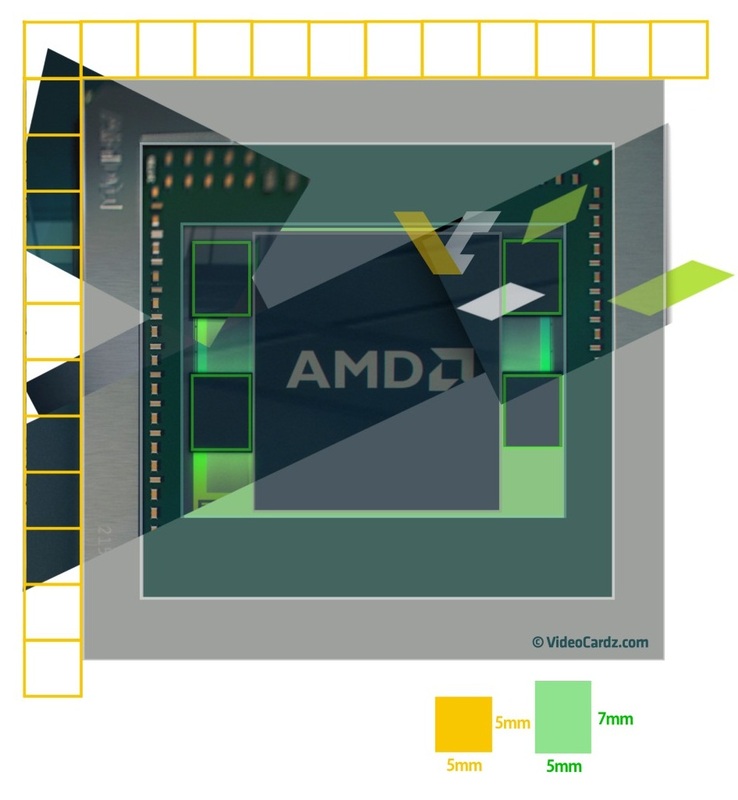 We went through AMD’s official rendering and measured the width pixel by pixel. And we arrived at exactly 21mm. The height is where it gets tricky however. We know for a fact that Fiji is at least 26mm long, this is again by using HBM’s length, which we know to be 7mm, as a measuring stick. So finally, we arrive at GPU die size range of 546mm² to 588mm² based on a fixed width of 21mm and possible lengths ranging from 26mm to 28mm. We’ll take the average at 567mm² giving us a ~4% deviation range, which is actually quite decent. Let’s briefly discuss Fijis new secret weapon, HBM. 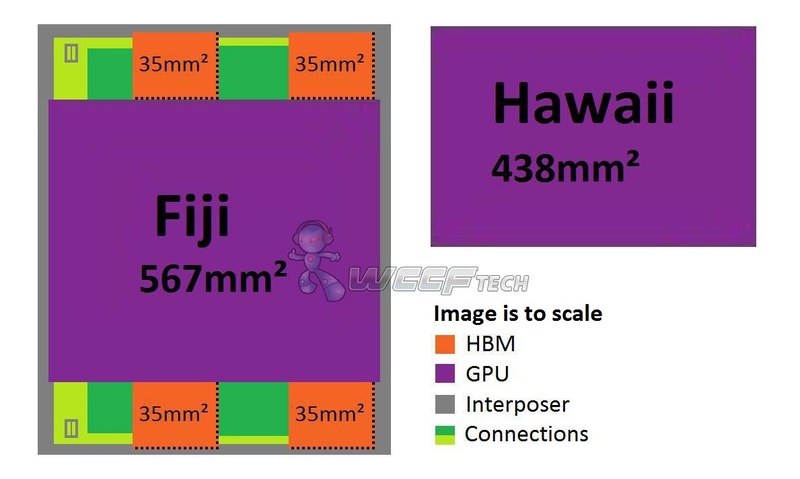 Below are the unconfirmed/unofficial specifications for Fiji based on the R9 390X WCE rumor ( except for memory capacity ). and the SiSoft Sandra database leak. * Estimated from core count and clock speed.